— not a great name, we know — and you’ll find it on your Google Account settings page. You can tell us what to do with your Gmail messages and data from several other Google services if your account becomes inactive for any reason. thanks guys; this is very comforting to know that my wife will have access to my data should the worst occur. 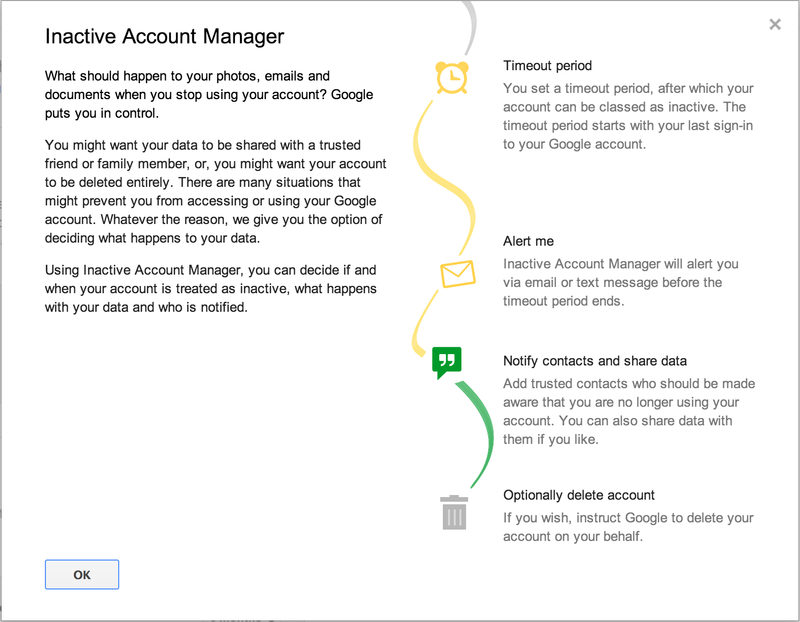 Will this feature be available for use in Google Apps accounts, or only Gmail personal accounts? Good initiative. It would be nice to be able to customise the delay after which messages are automatically sent to the different persons. E.g. 3 months for person A, 4 months for person B, etc. Damn it Google. I just can't quit you. I always thought about this... And Google has the solution ready... Love you all... Keep coming such great tools. You had me at "digital afterlife". Thank you again for all you do. I'm guessing the reason it's not available for Google Apps accounts is because in theory, those accounts are all owned by the company running it and the company would be responsible for users' data when they die. But some of us use Google Apps just for personal use so we can get email on our own domains through Google. What about us?? I want to ask same as James Wright: Google Apps? please. In my case we some personal information in our accounts on a family-only domain. I really hope you guys consider Google Apps, please. I have frequently thought about this as well. I don't want my private information falling into the wrong hands but because of my OCD, I don't really like the idea of it just sitting there, forever. This is a very helpful feature. I appreciate your support. Great! What's the max length of time you'll keep? Please say until the singularity! You cannot start with 'simply pathetic' and end with 'humble opinion'. There is nothing humble in your opinion. Some of us don't want our data to be shared with anyone or to be sitting there forever. So it is a worthwhile option. This service is for making your wife's life easier by managing your digital accounts for her so she can focus on other details of handling your death. It's a fantastic idea, and your opinion is wrong. Where do you think the deleted data go? Now you can set the time limit for how long after your existence ends, can you have access to your Google account on the other side of the life as you know. Would also be nice to enable without having to set the Notify Contacts and Share Data. Surely that should be optional too if you just want to delete? I think this is a good initiative by Google but still other assets such as iTune accounts, e-books should be transferred. I think services such as www.plannedDeparture.com can help address digital assets transfer issue. I think that this is a fantastic feature. You don't really want to be giving people your passwords just in case something happens, so this makes perfect sense. And why, oh why, are people not trusting their spouses with their passwords while they are alive? What if you don't have a spouse? What if you get a divorce and forgot to change your pw? I don't trust my wife with the admin password of her own pc, for that matter. She's more trustworthy than most (teaches ethics to grad students, among other things), but that is unrelated to the damage she can do from ignorance of technical capabilities. Come on, people, do I need to say it? DON'T SHARE PASSWORDS! And I can't say as I really trust google to do the right thing, between slipstreaming code changes that break security and eye-wideners like asking the first person to login at some random time to add their phone number, jeez, I want rubber biscuits. I use my gmail to catalogue my research. I send myself notes, thoughts, creative ideas etc and I have set up filters to put these in the right folders. What would be a very innovative feature is to allow specific folders to be linked to third party emails so in the case of death appointed emailees could be alerted and have access to those folders. I can just imagine lawyers licking their lips at the amount of additional work that has been created by transference of people's digital footprints in wills and the like. It certainly opens up many complex issues. I can't access my old account. But this new feature doesn't let me do so either. So what's the point of the new feature!? I don't have a Google+ of Scholar account because of this. It's a fantastic idea! I just would like a longer period of time to be set, like even as long as 2 years. I know Google can afford to wait that long. It would make sure that people who perhaps get in some sort of shipwreck or political situation in another country or something wouldn't have their data erased as easily. What happens if we don't set anything...ie, what is the default? I'd like an option for my data to sit there forever...I've left my passwords in digital files and documents for my son, but if I died tomorrow he wouldn't check them for many years as he is too young. Wil Je mijn password hebben ,komt ie: "Ikhebhelemaalgeenpassword"
Apparently you have to have SMS services to die, nowadays. Wish there was a way to get one without paying at least $10/month. If I select the delete option, how long do my trusted contacts have to download the data before Google deletes it? hmm that make me a bit worried if policy changes after someone has died ? I have/had a friend who died a year ago now, who left more than 300 videos of his european travels. I hate to think that all his work will be just deleted as there is no one now who would be contacted, he was a very old man. He died within a few months of his last trip that took him many hours while in a hospice to post on YouTube. It meant so much to him ( search 481karl on Youtube) what about people like that? Awesome. I was just thinking about it yesterday and I have it today. Its just amazing how you can read my thoughts. 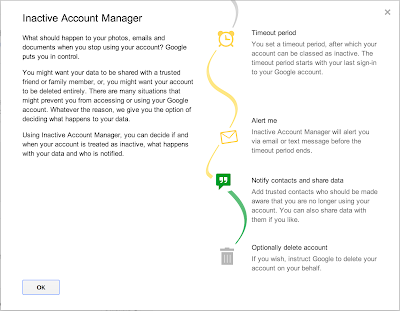 "You are trying to access Inactive Account Manager from a Google Apps Account. Inactive Account Manager is only available for Google Accounts." Sign up for a GV number (this is free), use that as the SMS number. *That* is the data I want to delete if the account becomes inactive. What about Google Adsense. Will this work for that services also? I'm only 21 and I think this is an excellent idea. Considering how much data of practical (ex: financial information) and sentimental (ex: pictures of me and grandma) value most of us have online this is an idea whose time has come! Think of the extra stress your loved ones and friends would have to go through trying to access this data when you die if this wasn't set up. Nice Feature from Google. Personally I would defiantly choose to delete data rather than giving access to my personal data to anyone(though they are family) ! Google is by far the best company ever. From android to web to chrome i use their products all day every day and this is just another example of how they understand their users and their needs, go on google ya good thing! Hi Google - please switch on for Google Apps too. I use Google Apps for my family. If the issue is that Apps is also run by business, you could have it limited so that it only gives access to another account on the same domain, or have the admin control panel able to turn the feature on for the domain or even for individual accounts. I hope you can do this, otherwise, the features pretty useless to me and anyone else who has a personal Google Apps. If the user is really dead, you can add the "lay flowers" on its virtual pedestal. thereby relatives who can not come to a great distance can pay tribute to a man. Great idea.... The problem is I also do not have a land-line, otherwise I would be all over this... I agree, not fair.. This is very nice feature for google services. I can't help but notice that adsense data is not included in the list for deletion. How odd. Nevertheless, this is a good idea. probably. I wonder if you should also add counselling advice to the page. I'm not sure if granting access to the "dead" - months after the fact - would be a selfish act on the part of the deceased in that the sense of loss experienced by those left behind would have to be re-experienced yet again (sore wounds opened). I like the idea. We are never really prepared for the end and this could enable people to put things in place for their loved ones should the unexpected happen. How long before someone uses this for the ultimate rickroll? I login my account not very often, may be one or ten years one time. But the account is in use. Don't put me to go. I wonder if this means there's no Google in the afterlife. We might have to use Yahoo! in Heaven, and hotmail in hell. I'm dissapointed this is not enabled for Google Apps. Excellent idea, and mostly very well implemented. But useless to me because it demands a phone number to send SMS to, which I don't have. I'm pleased to see it will send warnings to several email addresses, but could you make the phone message optional? I keep getting "Could not verify phone number" in a red box at the top of the page. However, it is not sending me a code as requested, nor is the box where I am entering the code being drawn. There is www.RecordMeNow.org for after your die. How do I know this ? - I am one of the authors ! Thank you for taking time to realize the importance of this feature. Awesome idea for an application! Will your "trusted contacts" be notified at the time that you add them as trusted contacts (i.e. now?) Or can you write something nice and personal in the message field that you only want them to see if the worst happens? It should be possible to check a checkbox that generates a new password for the trusted contacts. It will be easy to forget to update this info when you change your password. In the early days when I did not know how Google works,I gave my real name.How can I delete those posts as I wish to remain anonymous for those postings ? This feature has been directly inspired from my blog. The death report mechanism is exactly the same as I proposed. Do read and comment back.